When researchers at Montana State University hosted a conference about snow and avalanches in Bozeman during the fall of 1982, they made flyers featuring ski tracks alongside a math equation, planned a field day and after-party at nearby Bridger Bowl ski area, and called the event the International Snow Science Workshop. Because most of the 220 participants were Americans or Canadians, "the 'international' part was a little bit tongue in cheek," said Ed Adams, one of the event's organizers and a recently retired MSU civil engineering professor. Still, the name gave the event — which has since been held at least every two years — "room to grow," he said. And grow it has. Last month, Adams and more than a dozen other locals joined roughly 1,000 attendees from 27 countries at the 2018 International Snow Science Workshop in Innsbruck, Austria, a colorful city often referred to as the capital of the Alps. Billed as the world's largest conference on snow and avalanches, the five-day event featured panel discussions, 140 presentations by world experts and 285 posters in an exhibition where researchers, avalanche forecasters and others discussed their work. MSU faculty and students presented a total of 23 papers, including seven papers with students as lead authors. With topics ranging from the microscopic properties of snow crystals to satellite imaging to best practices for rescue operations, the ISSW covers "the full gamut of snow science," said MSU earth sciences professor Jordy Hendrikx, who attended with four of his graduate students. Hendrikx chaired a session in which MSU earth sciences master's student John Sykes presented research he has conducted at Bridger Bowl about how skiers and snowboarders make decisions in avalanche terrain. As a result of the project, Sykes was one of three recipients — out of roughly 50 submissions — of the ISSW's Young Snow Professional Award. Adams chaired a session about snowpack stability that featured presentations by Benjamin Reuter, a Swiss researcher visiting MSU to conduct studies in the university’s Subzero Research Laboratory, as well as Karl Birkeland, director of the Bozeman-based National Avalanche Center. "Usually these sorts of things are all scientists ... with a separate meeting for practitioners to talk about problems and solutions," said Birkeland, who chaired a session about how forecasters and others communicate avalanche hazard. "The cool thing about ISSW is that it brings those two together." Avalanche forecasters from Montana and across the U.S. were among the participants at the event, as were ski patrollers, including from nearby Big Sky Resort, according to Birkeland. "Listening to people talk about the issues they're dealing with in the field helps spur ideas for research," said MSU assistant professor of civil engineering Kevin Hammonds, director of MSU's Subzero Research Laboratory. Hemmonds presented a study on how naturally occurring chemical impurities affect the bonds between ice and snow grains. 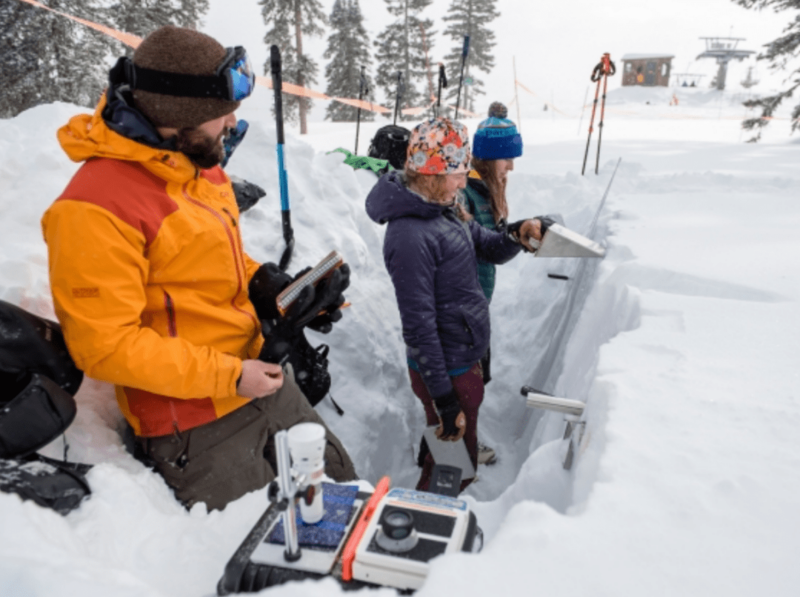 According to Adams, the ISSW has flourished because, as snow science has advanced and winter recreationists increasingly venture into the backcountry, the event fills a need for practitioners to exchange information with researchers. The workshop's practical bent emerged from the milieu of MSU snow science, which was pioneered starting in the 1950s by earth sciences professors Charles Bradley and John Montagne, both of whom were avid skiers involved in the creation of Bridger Bowl. Montagne was the first director of Bridger Bowl's volunteer ski patrol, and he also taught a popular undergraduate class that emphasized practical skills for assessing avalanche danger. His and Bradley's scientific studies — which became more rigorous and internationally recognized after Bradley recruited MSU engineers — often revolved around predicting and preventing avalanches at the community ski area. Shortly after Adams came to MSU in the late 1970s to study snow science, Montagne spearheaded the effort to create the ISSW, Adams recalled. Building on a tradition of more informal snow conferences in the U.S. and Canada, MSU's snow scientists coined the ISSW name and gave the event its enduring motto: "A Merging of Theory and Practice." "The motto really says it all," said American Avalanche Association director Dan Kaveney, who lives in Bozeman and attended the Innsbruck event. Birkeland first attended the ISSW in 1988 at Whistler, British Columbia, where the MSU contingent endured a week of rain while camping on the outskirts of town, he recalled. At the time, he was earning his master's in snow science in MSU's Department of Earth Sciences after working as a ski patroller at Utah's Snow Basin. He found the conference to be "instantly relatable," he said. At the 1990 ISSW in Bigfork, Montana, he presented his master's thesis, which built on Bradley's early experiments about how snowpack stability varies across mountain slopes. Now, when he returns from ISSW, Birkeland writes a synopsis of select presentations and sends it to avalanche forecasters around the country, some of whom may not have attended the event. The summary includes links to the full text of the conference proceedings. Since 2012, as a result of an effort led by former earth sciences department head Steve Custer, all ISSW proceedings have been housed in a digital archive maintained by the MSU Library. "The whole avalanche community is so grateful to MSU for doing this," said Birkeland, who is also an adjunct professor in MSU's earth sciences department. "For people looking for practical, scientific avalanche work, it's probably the first place that most people look." "Ultimately, bringing people together at the ISSW has advanced our knowledge much more than if it never existed," Birkeland said. "ISSW has made people here, and around the world, safer from avalanches."